I had to chuckle at this quip by Jake Sully when he was asked by Dr. Grace Augustine about the amount of training that he had for the mission on Pandora. It reminded me of a similar dialogue in The Big Bang Theory when Sheldon asked Penny about her knowledge of science. While dissecting frogs can be messy enough to make you feel like you gutted a deer, reviewing Avatar won't be. In fact, this is going to be a swift one since I'm generally impressed by the movie. I watched it in IMAX yesterday with a friend. When I found out that it was available in 3D format, I knew that was the only way to watch it. I'm pleased by that decision despite shelling out a few hundred pesos for a ticket. Absolutely no regrets. The moment I put on the 3D glasses, I knew I was in for a visual treat and James Cameron didn't disappoint. The level of detail was astonishing -- from the base of the RDA corporation to Pandora's flora and fauna. While there were some bits that were seen in other movies, say for example the mech suit used by Col. Quaritch, these seem to blend well with the movie's overall environment. 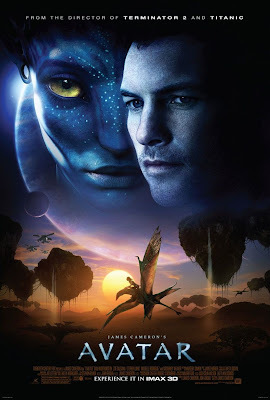 Despite its sensory brilliance, Avatar was one of those movies I wouldn't pay to watch again. For one reason: the simplicity of the plot. Don't get my wrong. The plot is good. I easily understood it and had no questions. However, it didn't have a lingering effect, the elusive IT factor, that would make me watch it over and over again until I'm sated. Only three movies did that for me this year -- Star Trek XI, Harry Potter and The Half-Blood Prince, and The Twilight Saga: New Moon. Avatar didn't move me emotionally as well; Up and District 9 filled those shoes quite nicely. Aside from the plot's simple nature, the acting may have contributed to it as well. To be honest, I like the cast (Hello Giovanni Ribisi! And Sigourney Weaver!) but their performances were a bit off or somewhat needed a little push in the right direction. Those who stood out for me were Joel David Moore (Norm Spellman) and Zoë Saldaña (Neytiri). Seeing CCH Pounder's name in the end credits was a welcome surprise to me. Sam Worthington had the right look for the part but there were instances when I was expecting more emotion, more depth from his face which looked blank at times. Michelle Rodriguez was being... well... Michelle Rodriguez. Overall, I still recommend that you watch this. If you love movies, Avatar is something you should never pass up. I will suggest though that you watch it right, especially if you just plan to see it once. Check it out in IMAX 3D, no less. Don the glasses because if you're going to see it in regular format, you will miss a lot. Happy Christmas everyone! Hope you're having a good one. Instead of talking about my recent hauls or the fun stuff I received from friends and loved ones, I'd rather blog about something really COOL and AWESOME. The witty folks over at Film School Rejects tweeted this year-end mashup by Kees van Dijkhuizen. For a person who loves watching movies, it's an fab recap to the year that was. Enjoy, share and don't forget to credit! Apologies for the gap in between blog posts: it's part work-imposed, part lazy bones. All I could afford now is to share the things I look forward to. And these two movie trailers I'm sharing are definitely going to be on my watch list this 2010. I have seen this for quite sometime now. Still never fails to elicit that cheeky smile and warm feeling. Rob and Emilie de Ravin (Lost) have great chemistry. Not much is known about the movie except that it tells a tale of two lovers, Tyler and Ally, whose relationship is in danger because of their respective family tragedies. Pierce Brosnan, Chris Cooper and Lena Olin also star. Now this one, I have been itching to see any teasers the moment I found out that both Kristen and Dakota were signed on to this movie. And thanks to a good friend, here's the teaser. Suffice to say, I'm blown away. Rock on girls!